The town of Carrickfergus is in County Antrim, Northern Ireland, and is only a few miles up the coast from Belfast. It’s one of the oldest settlements in Ireland and is known to have been a small town in the 1100s. 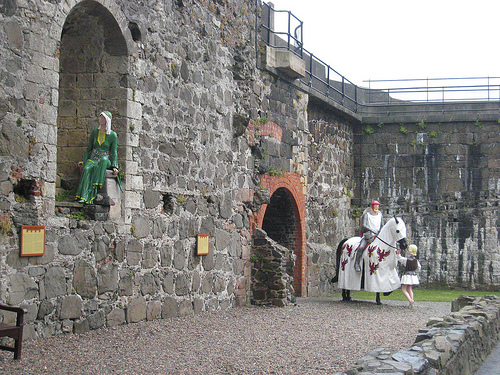 It was around this time that the original Carrickfergus Castle was built by John de Courcy, an Anglo-Norman knight. Since those early days, the town has been the location for a number of historical events, including the Battle of Carrickfergus in 1597 and the last witch trial to be held in Ireland, which took place in 1711. In more recent times, the Titanic set sail up the Belfast lough, passing the town on its first and last voyage. Today the town is a picturesque place with a busy marina and a large sailing community. The castle continues to loom large over the town and is one of its most popular attractions, but if you are wishing to explore the lovely Causeway Coast, Carrickfergus is an excellent starting point. The visitor centre is the best place to start off at when you arrive in Carrickfergus and here you will be able to find out information such as opening times for local attractions. If you are interested in history, Carrickfergus is a great place to spend some quality time. The town is steeped in history and the town centre is enclosed within 16th Jacobean stone walls. Over the years, there have been royal visitors a plenty, from King John in 1210 to King William of Orange in 1690, and the best place to find out the background to these stories is at the Carrickfergus Museum. Here you will find lots of interesting interactive and audiovisual exhibits, plus a café and gift shop. Once you have had your fill of history, explore the pretty walkways through the town and admire the public art displays. The marina and new waterfront development is also very attractive and on a fine day, there are some great views from the coastline around Carrickfergus. If you are lucky, you may be able to spot seals basking on the rocks and eagles soaring far above. Carrickfergus Castle is the most popular attraction in Carrickfergus, and deservedly so. The castle is the most prominent feature in the town—come rain or shine it looms over Carrickfergus like a giant stone sentry. The castle is open to visitors all year round and you can either explore it under your own steam or book a guided tour. The Andrew Jackson Cottage and US Rangers Centre is another interesting attraction. Come here to find out more about Carrickfergus’ connection with America and the 7th US President. Flame! The Gasworks Museum is one of the last three remaining coal gasworks in the British Isles. It tells the story of how gas was extracted from coal and used to provide light and heat in local homes. St Nicholas’ Church dates back to 1182. A 16th century Flemish artist painted the stained glass windows and they are unique.